These homes make living in the heat of the desert look easy, breezy, and cool. As we’ve covered before, there are four basic climate zones in the United States, each with their own set of environmental and climatic strategies that should be taken into consideration when designing and siting a home. The hot, arid regions of the desert require special attention to sunlight and shade, massing and orientation, and natural ventilation—among other qualities. 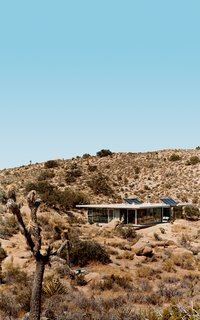 Read on as we take a look at some fabulous, sustainably oriented desert homes in the American Southwest. 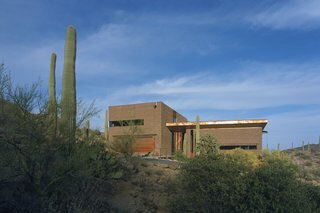 A lone saguaro marks the southwest corner of Thomas and Laura Hyland’s property, which is situated adjacent to the Phoenix Mountain Preserve and was designed by Wendell Burnette. The structure’s main living volume is elevated and faced in glass, overlooking a descending pathway that leads to a pool tucked into the site. 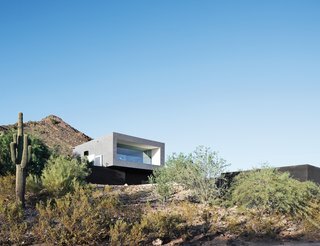 The glazed wall is shaded from the strong desert sun with a deep overhang, while the other walls are relatively solid, reducing the impact of the sun on the rest of the home's interior. 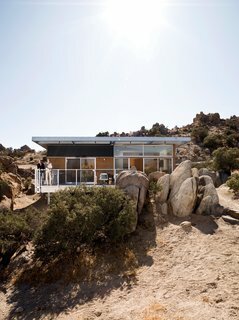 At a Blue Sky prototype house just north of Joshua Tree National Park, each room has a door to the outside, providing easy and quick access to the two and a half acres of natural landscape. Sliding doors contrast with wood paneling to ensure a balance of light and shade on the interiors, while clerestory windows provide even, non-direct light. 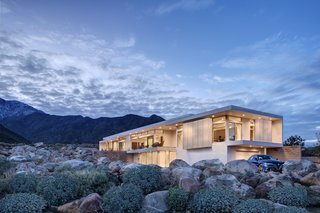 This sleek prefabricated home by Marmol Radziner is located atop a sparse hill in Desert Hot Springs, near Palm Springs, California. Despite the area's seasonal harsh winds, the architects created a south wing with a master bedroom and a guest room and studio in a separate wing at the north end of the site. They're separated by covered concrete decks around a swimming pool in order to create an outdoor area that's protected from the harsh sun. High ceilings also encourage natural ventilation, while large expanses of glass are shaded by deep overhangs. 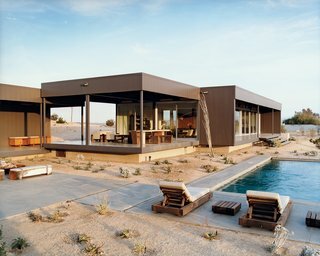 In a completely exposed, glass-box home in the high desert east of Los Angeles, Linda Taalman and Alan Koch of Taalman Koch Architects selected passive heating and cooling strategies, including windows and sliding doors made of Solar Ban 60 glass and coated with a low-e coating for long-wave radiation. The roof is configured so that it blocks the summer sun, but windows have been oriented so that in winter, when the sun is lower and temperatures drop, sunlight can penetrate through the windows. Solar power generates hot water and electricity. 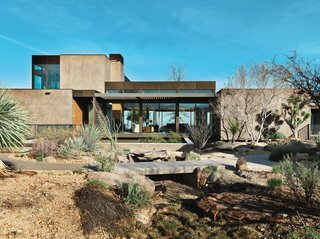 Three pavilions of masonry, rusted steel, and glass come together in Tucson, Arizona, to create a home designed by Ibarra Rosano Design Architects that draws inspiration from the desert landscape. Each facade is in direct response to the sun, wind, topography, vegetation, and views. Windows are long and shaded, entryways are covered, and views are curated to capture indirect sunlight and provide vistas of the landscape beyond. A C-shaped house on the western edge of Las Vegas uses prefabricated, steel-frame modules that were created in Los Angeles with finished floors, walls, doors, and fenestration. The use of modular elements reduced the environmental impact of this new home, which offers views of the glittering Las Vegas strip in one direction and the desert near Red Rock Canyon in another. Slatted, anodized-aluminum canopies shade the home's multiple indoor/outdoor spaces. As part of a new midcentury modern-inspired development in Palm Springs, this home designed by o2 Architecture features deep overhangs, clerestory windows for indirect light, and a white exterior to reflect the strong desert sun. The home's split-level design is an homage to the area's legendary modernist homes. It engages with the topography and preserves the natural contours of the land—in keeping with the goals of sustainability.